Most wars last years. This one has to be over by dinner. Thank God that this wasn't a Hollywood movie! Ireland is developing quite an interesting film industry. 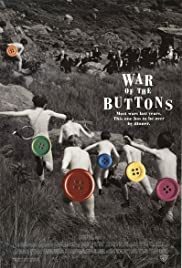 In "War of the Buttons", the children from rival towns are always sparring over buttons. They come up with every neat way to get revenge on each other. One of the reasons that this movie was so interesting was because it wasn't one of these situations where against all odds the ragtag team beats the big guys with all the money; in this case, they were equally matched. Also, we get to see how the Irish are trying to revive their culture: the schools are teaching the native Irish language. The only two cast members whom I recognized were Colm Meaney and Milo O'Shea, but the the whole cast did quite well. An excellent movie.